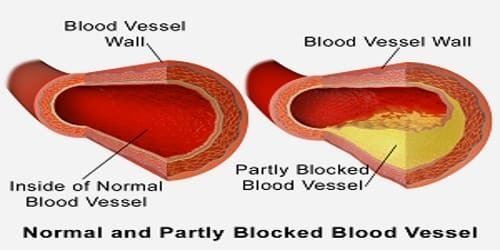 Definition: Atherosclerosis, also known as arteriosclerotic vascular disease, occurs when the blood vessels that carry oxygen and nutrients from our heart to the rest of our body (arteries) become thick and stiff — sometimes restricting blood flow to our organs and tissues. Initially, there are generally no symptoms. When severe, it can result in coronary artery disease, stroke, peripheral artery disease, or kidney problems, depending on which arteries are affected. Symptoms, if they occur, generally do not begin until middle age. The disease disrupts the flow of blood around the body, posing the risk of serious complications. Atherosclerosis starts when the endothelium becomes damaged, allowing the harmful type of cholesterol to build up in the artery wall. The body sends a type of white blood cell to clean up this cholesterol, but, sometimes, the cells get stuck at the affected site. Over time, plaque can build up, made of cholesterol, macrophages, calcium, and other substances from the blood. The exact cause is not known. 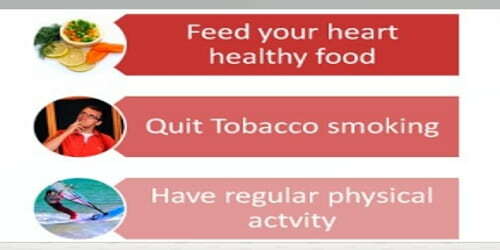 Risk factors include abnormal cholesterol levels, high blood pressure, diabetes, smoking, obesity, family history, and an unhealthy diet. Plaque is made up of fat, cholesterol, calcium, and other substances found in the blood. The narrowing of arteries limits the flow of oxygen-rich blood to parts of the body. Diagnosis is based upon a physical exam, electrocardiogram, and exercise stress test, among others. Atherosclerosis was first described in 1575. Atherosclerosis generally starts when a person is young and worsens with age. Almost all people are affected to some degree by the age of 65. 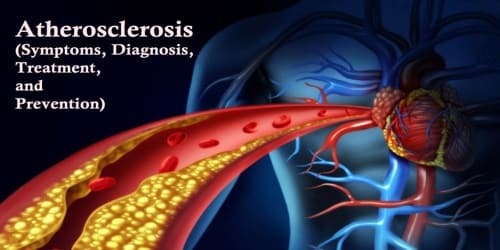 Atherosclerosis is the number one cause of death and disability in the developed world. 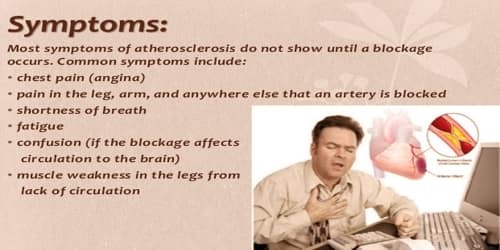 Signs and Symptoms of Atherosclerosis: The first signs of atherosclerosis can begin to develop during adolescence, with streaks of white blood cells appearing on the artery wall. Most often, there are no symptoms until a plaque ruptures, or the blood flow is very restricted. This typically takes many years to occur. Coronary arteries provide blood to the heart. When the blood supply to the heart is limited, it can cause angina and heart attack. Renal arteries supply blood to the kidneys. If the blood supply becomes limited, there is a serious risk of developing chronic kidney disease. If people think they have atherosclerosis, talk to the doctor. Also pay attention to early symptoms of inadequate blood flow, such as chest pain (angina), leg pain or numbness. Early diagnosis and treatment can stop atherosclerosis from worsening and prevent a heart attack, stroke or another medical emergency. Lifestyle changes: These focus on weight management, physical activity, and a healthy diet. 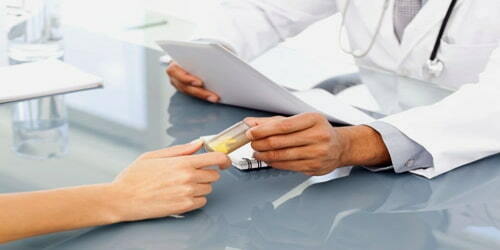 Medication: Antiplatelet medications can prevent the buildup of plaque or help prevent blood clots. Others, such as statins, might be prescribed to lower cholesterol, and angiotensin-converting enzyme (ACE) inhibitors can help lower blood pressure. Surgery: Severe cases of atherosclerosis may be treated by surgical procedures, such as angioplasty or coronary artery bypass grafting (CABG). Angioplasty involves expanding the artery and opening the blockage so that the blood can flow through properly again. CABG is another form of surgery that can improve blood flow to the heart by using arteries from other parts of the body to bypass a narrowed coronary artery. Preventions of Atherosclerosis: Up to 90% of cardiovascular disease may be preventable if established risk factors are avoided. Medical management of atherosclerosis first involves modification to risk factors–for example, via smoking cessation and diet restrictions. Prevention then is generally by eating a healthy diet, exercising, not smoking, and maintaining a normal weight. Just remember to make changes one step at a time, and keep in mind what lifestyle changes are manageable for people in the long run.